I attended Yukirin’s 1st Solo Tour concerts in Osaka and Nagoya. Here is my report from the Osaka concert. It’s a mix of things I remember and my comments from the Osaka concert. Disclaimer: I am a Noise Engineering, while I don’t do sound engineering but as part of my work, I do design theatres, etc., so I care a lot about acoustics and the sound of things. Osaka Festival Hall was renovated a few years ago and is now a true musical hall. The Osaka Festival hall has world class acoustical design so I was really excited about Yukirin performing there! Warning: This report is kinda long! The intro music begins and Yukirin pops up from the upper stage. Perfect song to start a concert, gets the whole crowd going with the mixing. And no one is gonna argue with her starting off with “I’m the Theatre no Megami” cause she owns the stage! The vocal range of this song is just right for Yukirin as it’s not too low. For most of the songs, the penlight colour was Blue, for obvious reasons. Yukirin was just shining on stage! I was never a big fan of this song until I attended Team B’s concert in 2014. The crowd mix for this song makes it so much more fun. This version with a live band is even better! This is the first time you really get to see how Yukirin does her recording for the radio show. The VTR is basically a short version of her radio show where she throws the dice and answers the question. Questions are like what is your favourite food from Osaka, etc. This song totally did it for me, it is still the song that I think about the most from the concert. 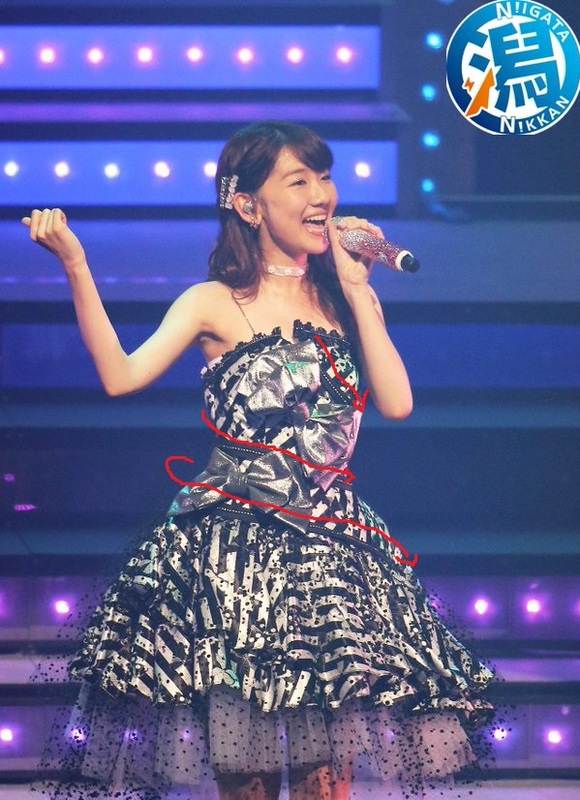 You can tell just how much Yukirin’s vocals have improved since her Yokohama Arena concert. She handled the rap with ease, it’s soft rap which is how I prefer it, not so much the strong rap that Takamina does cause it doesn’t match the rest of the song. And at the “Just get stronger” part where Yukirin belted it out at the end, I literally said out loud at that moment, “WOW!” It made me smile, it made me “wow”, it me made think just how much work Yukirin puts in on a regular basis on her vocals. This solo version of Green Flash left a lasting memory for me. Also, almost everyone switched their penlight to green, so it was just a beautiful song, a beautiful scene. Yukirin goes right into a fun song after Zipper. But how did she unzip her dress by herself you ask? Well, Shinobu & her Team has it well thought out. Though, Yukirin still had a bit of trouble with it (LOL). The zipper goes around her body several times so as she is singing, she switches her mic hands a few times, and moves the zipper from upper body to lower body. See picture below of where the zipper is, marked with red arrows. No surprise, Yukirin talks about the weather as it pretty much down poured the whole day! She mentioned how it was nice weather in Tokyo, as she was riding the bullet train, it was still nice in Nagoya, and then she got into Osaka and it was pouring rain. Yukirin also talks about the Hall, how typically orchestra performs there, also other big artists. The crowd yells out HKT, and Yukirin is like…”eeeeh, HKT performed here.” The crowd laughed at her reaction. I was really excitedto hear Yukirin’s solo version cause I knew this song really suited her voice. Her version is of course more mellow compared to Sayanee’s solo version and so it was just very different style. Yukirin talked about having a hard time deciding which songs to perform for the Osaka concert. Since she was NMB kennin, she was also in senbatsu for 3 songs but Don’t Look Back was definitely out as a song choice. She joked that she doesn’t remember the dance at all. A note about the band, the bass player switches from guitar bass to string bass (double bass). The next 3 songs are mainly acoustic guitar, bass and violin. It really added an extra element to the next 3 songs since they are all ballads. I got goosebumps. For this song, Yukirin sits on a swing and is lifted up. For safety, she has to a wear a seat belt, but she wasn’t able to lock it during the opening interlude of the song so then she had to try and do it with one hand while she was singing. You can kinda feel that all the fans were worried (including me though I was sure they wouldn’t lift her until she had the belt locked). It took quite a few tries since she was only doing it with one hand, Yukirin finally locked her belt and everyone had a sigh of relief. Yukirin was then lifted up to the top, after the first chorus, Yukirin asked the crowd to sing the B refrain with the lyrics up on the screen. I love it when the crowd sings and this time I get to be part of it!!! My all time favourite Yukirin solo song. To hear her sing this song live was a definite dream come true! Yukirin sat down on the steps and sang this song. It was a wonderful acoustic version. A different feel compared to her other version with Oshio Kotaro (coupling on Shortcake single). Can’t think of anything unique. But every time I hear this song, I just think of SaeYuki! Can’t be helped, I’m such a SaeYuki shipper. Music Interlude (Yukirin changes), violin solo version of Mirai Bashi. I was sooo absorbed into the music while Ayasa was playing. It sounded so good in the hall!!!! Yukirin played the first three notes, and I thought, well, it’s the effort that counts right. LOL! Her fingers were definitely off so the notes were off. Yukirin played just the solo melody parts through out the song. At the first solo part, she started it and halfway through, I was like, wow, she sounds great. Of course, she explains why in the MC after the song. Lately, lots of fans have been calling me Kashiwagi-san. At the Hiroshima handshake event the other day, people were also calling me Yuki-sama. The crowd starts yelling both. For this song, it was about audience interaction. Yukirin had a Yukirin daruma penlight and she picked green for this song. She also taught us two hand movements for the song. On the screen, a Yukirin daruma also directed us the hand movements. It was a lot of fun though it was kinda hard to get all the “punch” part on beat. The crowd would sing all the parts in the brackets. Solo versions are great cause all you do is keep calling “Yukirin”. You can definitely tell with this song her vocal improvements from past concerts. I always liked this song, but after Yukirin’s version, I really like this song. The song is great with a live band! Awesome last song, the whole crowd was dancing with it, and Ponytail to Shushu is an awesome mix song! The crowd was soooo into it!!! Even though I have been fortunate to get a variety of work like dramas, radio shows, etc., but at the end, I simply love lives. As an actress, you just have to finish filming and once it airs, that’s it. But concerts can’t be held without audiences, handshake events can’t take place without fans. So I’m grateful to be able to perform on stage. I really love lives. I hope more people will like me, but I also want fans that have been by my side to like me even more. This song has so much meaning and Yukirin talked and emphasized a few times that without the fans, she wouldn’t be where she is and she wouldn’t be able to stand on the stage and perform. I think any Yukirin fan who listens to this song can related to all the lyrics. I almost got teary eyed during this song. I felt as if Yukirin was singing to me. I truly felt that Yukirin just simply belongs on stage. She totally owned the stage!! She was so shining!!! i wish they could release the BR. yukirin just show how GF really should be. (akip you lame! in GF single you let your feeling beat your professionalism as producer) .